Motto: ᓄᓇᕗᑦ ᓴᙱᓂᕗᑦInvalid language code. Nunavut ( /ˈnuːnəˌvuːt/; French: [nynavy(t)]; Inuktitut syllabics ᓄᓇᕗᑦ Template:IPA-iu) is the newest, largest, and northernmost territory of Canada. It was separated officially from the Northwest Territories on April 1, 1999, via the Nunavut Act and the Nunavut Land Claims Agreement Act, though the boundaries had been contemplatively drawn in 1993. The creation of Nunavut resulted in the first major change to Canada's political map since the incorporation of the province of Newfoundland and Labrador in 1949. Nunavut covers 1,877,787 km2 (725,018 sq mi) of land and 160,935 km2 (62,137 sq mi) of water in Northern Canada. The territory includes part of the mainland, most of the Arctic Archipelago, and all of the islands in Hudson Bay, James Bay, and Ungava Bay, including the Belcher Islands, which belonged to the Northwest Territories. This makes it the fifth-largest subnational entity (or administrative division) in the world. If Nunavut were a country, it would rank 15th in area. Nunavut has land borders with the Northwest Territories on several islands as well as the mainland, Manitoba to the south of the Nunavut mainland, Saskatchewan to the southwest (at a single four-corner point), and a small land border with Newfoundland and Labrador on Killiniq Island and with Ontario in two small locations in James Bay: the larger located west of Akimiski Island, and the smaller around the Albany River near Fafard Island. It also shares maritime borders with Greenland and the provinces of Quebec, Ontario, and Manitoba. Cornwallis and Ellesmere Islands featured in the history of the Cold War in the 1950s. Concerned about the area's strategic geopolitical position, the federal government relocated Inuit from Nunavik (northern Quebec) to Resolute and Grise Fiord. In the unfamiliar and hostile conditions, they faced starvation but were forced to stay. Forty years later, the Royal Commission on Aboriginal Peoples issued a report titled The High Arctic Relocation: A Report on the 1953–55 Relocation. The government paid compensation to those affected and their descendents and on August 18, 2010 in Inukjuak, Nunavik, the Honourable John Duncan, PC, MP, previous Minister of Indian Affairs and Northern Development and Federal Interlocutor for Métis and Non-Status Indians apologized on behalf of the Government of Canada for the relocation of Inuit to the High Arctic. Discussions on dividing the Northwest Territories along ethnic lines began in the 1950s, and legislation to do this was introduced in 1963. After its failure a federal commission recommended against such a measure. In 1976, as part of the land claims negotiations between the Inuit Tapiriit Kanatami (then called the "Inuit Tapirisat of Canada") and the federal government, the parties discussed division of the Northwest Territories to provide a separate territory for the Inuit. On April 14, 1982, a plebiscite on division was held throughout the Northwest Territories. A majority of the residents voted in favour and the federal government gave a conditional agreement seven months later. As of the 2016 Canada Census, the population of Nunavut was 35,944, a 12.7% increase from 2011. In 2006, 24,640 people identified themselves as Inuit (83.6% of the total population), 100 as First Nations (0.34%), 130 Métis (0.44%) and 4,410 as non-aboriginal (14.96%). The largest denominations by number of adherents according to the 2001 census were the Anglican Church of Canada with 15,440 (58%); the Roman Catholic Church (Roman Catholic Diocese of Churchill-Hudson Bay) with 6,205 (23%); and Pentecostal with 1,175 (4%). In total, 93.2% of the population were Christian. Agnico-Eagle Mines Ltd – Meadowbank Division. Meadowbank is an open pit gold mine with an estimated mine life 2010–2020 and employs 680 persons. The second recently opened mine in production is the Mary River Iron Ore mine operated by Baffinland Iron Mines. It is located close to Pond Inlet on North Baffin Island. They produce a high grade direct ship iron ore. The members of the unicameral Legislative Assembly of Nunavut are elected individually; there are no parties and the legislature is consensus-based. The head of government, the premier of Nunavut, is elected by, and from the members of the legislative assembly. As of November 17, 2017, the Premier is Paul Quassa. Former Premier Paul Okalik set up an advisory council of eleven elders, whose function it is to help incorporate "Inuit Qaujimajatuqangit" (Inuit culture and traditional knowledge, often referred to in English as "IQ") into the territory's political and governmental decisions. Despite the restrictions, alcohol's availability leads to widespread alcohol related crime. One lawyer estimated some 95% of police calls are alcohol-related. Alcohol is also believed to be a contributing factor to the territory's high rates of violence, suicide and homicide. A special task force created in 2010 to study and address the territory's increasing alcohol-related problems recommended the government ease alcohol restrictions. With prohibition shown to be highly ineffective historically, it is believed these laws contribute to the territory's widespread social ills. However, many residents are skeptical about the effectiveness of liquor sale liberalization and want to ban it completely. In 2014, Nunavut's government decided to move towards more legalization. A liquor store will be opened in Iqaluit, the capital, for the first time in 38 years. ^ a b "Consolidation of (S.Nu. 2008,c.10) (NIF) Official Languages Act". http://www.gov.nu.ca/sites/default/files/2015-07-28-official_language_act-conssnu2008c10.pdf. and "Consolidation of Inuit Language Protection Act". http://www.gov.nu.ca/sites/default/files/gnjustice2/justicedocuments/Consolidated%20Law/Current/635199485609218750-1283713084-consSNu2008c17.pdf. ^ Nunavummiut, the plural demonym for residents of Nunavut, appears throughout the Government of Nunavut website Script error, proceedings of the Nunavut legislature, and elsewhere. Nunavut Housing Corporation, Discussion Paper Released to Engage Nunavummiut on Development of Suicide Prevention Strategy. Alan Rayburn, previous head of the Canadian Permanent Committee of Geographical Names, opined that: "Nunavut is still too young to have acquired [a gentilé], although Nunavutan may be an obvious choice." In Naming Canada: stories about Canadian place names 2001. (2nd ed. ed.). Toronto: University of Toronto Press. (ISBN 0-8020-8293-9); p. 50. ^ a b c d e "Population and Dwelling Count Highlight Tables, 2016 Census". Statistics Canada. http://www12.statcan.gc.ca/census-recensement/2016/dp-pd/hlt-fst/pd-pl/Table.cfm?Lang=Eng&T=101&SR=1&S=3&O=D#tPopDwell. ^ "Gross domestic product, expenditure-based, by province and territory (2011)". Statistics Canada. November 19, 2013. http://www.statcan.gc.ca/tables-tableaux/sum-som/l01/cst01/econ15-eng.htm. Retrieved September 26, 2013. ^ "The Official Flower of Nunavut: Purple Saxifrage". Legislative Assembly of Nunavut. 2011. http://www.assembly.nu.ca/about-legislative-assembly/official-flower-nunavut. Retrieved July 31, 2011. ^ "The Official Bird of Nunavut: The Rock Ptarmigan". Legislative Assembly of Nunavut. 2011. http://www.assembly.nu.ca/about-legislative-assembly/official-bird-nunavut. Retrieved July 31, 2011. ^ a b "Nunavut Act". Justice Canada. 1993. http://laws-lois.justice.gc.ca/eng/acts/N-28.6/index.html. Retrieved April 26, 2007. ^ a b Justice Canada (1993). "Nunavut Land Claims Agreement Act". http://laws.justice.gc.ca/en/showdoc/cs/N-28.7//20070517/en?command=searchadvanced&caller=AD&search_type=bool&shorttitle=%20Nunavut%20Land%20Claims%20Agreement%20Act&day=17&month=5&year=2007&search_domain=cs&showall=L&statuteyear=all&lengthannual=50&length=50. Retrieved April 26, 2007. ^ "How to Get Here". Nunavut Tourism. http://www.nunavuttourism.com/planning-your-trip/how-to-get-here. Retrieved June 22, 2014. ^ "Canadian Forces Station Alert - 8 Wing". Royal Canadian Air Force. http://www.rcaf-arc.forces.gc.ca/en/8-wing/alert.page. ^ "Cold Places in Canada". The Canadian Encyclopedia. http://www.thecanadianencyclopedia.com/articles/cold-places-in-canada. Retrieved March 12, 2013. ^ "Origin of the names of Canada and its provinces and territories". Natural Resources Canada. http://www.nrcan.gc.ca/earth-sciences/geography/place-names/origins-geographical-names/9224. Retrieved December 24, 2017. ^ "CIA World Factbook". CIA. https://www.cia.gov/library/publications/the-world-factbook/geos/gl.html. Retrieved February 16, 2011. ^ "Nunavut Alert - Whale Cove" (CSV (4222 KB)). Canadian Climate Normals 1981–2010. Environment Canada. Climate ID: 2300MKF. ftp://client_climate@ftp.tor.ec.gc.ca/Pub/Normals/English/English_CSV_files/NU/NU_ALER-WHAL_ENG.csv. Retrieved November 27, 2013. ^ "Grise Fiord: History". Archived from the original on December 28, 2008. https://web.archive.org/web/20081228115824/http://www.grisefiord.ca/eng/history.html. ^ René Dussault and George Erasmus (1994). "The High Arctic Relocation: A Report on the 1953–55 Relocation". Royal Commission on Aboriginal Peoples, Toronto: Canadian Government Publishing. fedpubs.com. Archived from the original on October 1, 2009. https://web.archive.org/web/20091001232453/http://www.fedpubs.com/subject/aborig/arctic_reloc.htm. ^ Royte, Elizabeth (April 8, 2007). 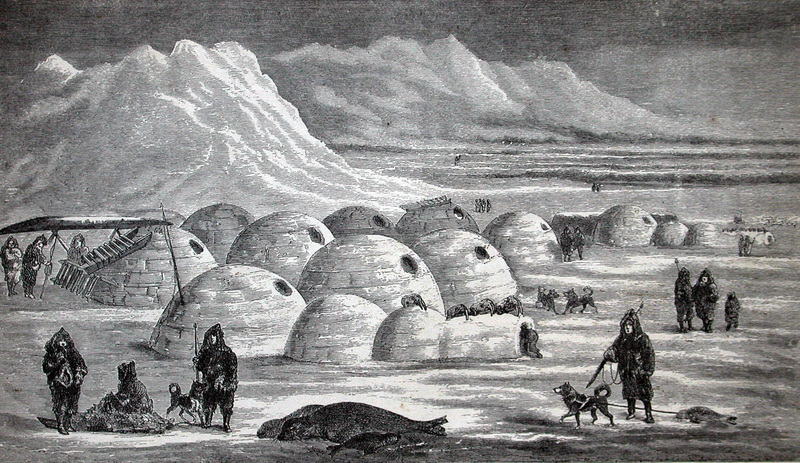 "Trail of Tears (review of Melanie McGrath, The Long Exile: A Tale of Inuit Betrayal and Survival in the High Arctic (2006)". The New York Times. https://www.nytimes.com/2007/04/08/books/review/Ro.t.html?ex=1188964800&en=4b6eb6a89d7e85dd&ei=5070. ^ Branch, Government of Canada; Indigenous and Northern Affairs Canada; Communications. "Apology for the Inuit High Arctic relocation". http://www.aadnc-aandc.gc.ca/eng/1100100016115/1100100016116. ^ "Creation of a New Northwest Territories - Legislative Assembly of The Northwest Territories". http://www.assembly.gov.nt.ca/visitors/creation-new-nwt. ^ Peter Jull (Summer 1988). "Building Nunavut: A Story of Inuit Self-Government". The Northern Review. Yukon College. pp. 59–72. http://www.yukoncollege.yk.ca/~agraham/jull/buildnun.htm. Retrieved February 16, 2009. ^ "Creation of Nunavut". CBC News. 2006. http://www.cbc.ca/archives/categories/politics/provincial-territorial-politics/creation-of-nunavut/topic-creation-of-nunavut.html. Retrieved April 26, 2007. ^ Statistics Canada (2006). "2006 Census Aboriginal Population Profiles". http://www12.statcan.ca/english/census06/data/profiles/aboriginal/Details/Page.cfm?Lang=E&Geo1=PR&Code1=62&Geo2=PR&Code2=01&Data=Count&SearchText=Nunavut&SearchType=Begins&SearchPR=01&B1=All&GeoLevel=&GeoCode=62. Retrieved January 16, 2008. ^ "Nunavut Tunngavik calls for equitable funding for Inuit languages - CBC News". http://www.cbc.ca/news/canada/north/equitable-funding-for-inuit-languages-1.4148129. ^ Board of Education (2000). "Summary of Aajiiqatigiingniq" (PDF). Retrieved on October 27, 2007. ^ "Detailed Mother Tongue (186), Knowledge of Official Languages (5), Age Groups (17A) (3) (2006 Census)". 2.statcan.ca. December 7, 2010. http://www12.statcan.ca/english/census06/data/topics/RetrieveProductTable.cfm?ALEVEL=3&APATH=3&CATNO=&DETAIL=0&DIM=&DS=99&FL=0&FREE=0&GAL=0&GC=99&GK=NA&GRP=1&IPS=&METH=0&ORDER=1&PID=89201&PTYPE=88971&RL=0&S=1&ShowAll=No&StartRow=1&SUB=701&Temporal=2006&Theme=70&VID=0&VNAMEE=&VNAMEF=&GID=838093. Retrieved February 16, 2011. ^ Population by knowledge of official language, by province and territory (2006 Census) Script error. Statistics Canada. Retrieved January 15, 2010. ^ "Selected Religions, for Canada, Provinces and Territories – 20% Sample Data". 2.statcan.ca. http://www12.statcan.ca/english/census01/products/highlight/Religion/Page.cfm?Lang=E&Geo=PR&View=1a&Code=62&Table=1&StartRec=1&Sort=2&B1=62&B2=All. Retrieved February 16, 2011. ^ "Wolfden Resources". Wolfden Resources. August 31, 2007. Archived from the original on July 19, 2008. https://web.archive.org/web/20080719141505/http://www.wolfdenresources.com/what_we_do/developmentProjects.aspx. Retrieved February 16, 2011. ^ "Nunasi Corp. sells its stake in NorTerra, Canadian North". April 1, 2014. http://www.cbc.ca/news/canada/north/nunasi-corp-sells-its-stake-in-norterra-canadian-north-1.2594298. ^ "NunatsiaqOnline 2014-04-01: NEWS: Nunasi Corp. sells its half of Norterra to the Inuvialuit". http://www.nunatsiaqonline.ca/stories/article/65674nunasi_corp._sells_stake_in_norterra/. ^ "Canada's North struggles to ditch diesel". Alberta Oil Magazine – Canada's leading source for oil and gas news. http://www.albertaoilmagazine.com/2011/07/canada%E2%80%99s-north-struggles-to-generate-a-cleaner-electricity-future/. ^ a b Van Loon, Jeremy (December 7, 2011). "Nunavut Region to Boost Renewable Power to Offset Climate Change". Bloomberg. https://www.bloomberg.com/news/articles/2011-12-07/nunavut-region-to-boost-renewable-power-to-offset-climate-change. ^ McDonald, N.C. (2012). "Renewable Energy Policies and Programs in Nunavut: Perspectives from the Federal and Territorial Governments". Arctic 65 (4): 465–475. DOI:10.14430/arctic4244. ^ Nicole C. McDonald & Joshua M. Pearce, "Community Voices: Perspectives on Renewable Energy in Nunavut" Script error, Arctic 66(1), pp. 94–104 (2013). ^ "Climate Change FAQ". Climate Change Nunavut. Archived from the original on July 9, 2013. https://web.archive.org/web/20130709090455/http://climatechangenunavut.ca/en/understanding-climate-change/climate-change-faq. ^ "Nellie Kusugak named as new Nunavut commissioner". June 23, 2015. http://www.cbc.ca/news/canada/north/nellie-kusugak-named-as-new-nunavut-commissioner-1.3124575. Retrieved April 9, 2017. ^ CBC Digital Archives (2006). "On the Nunavut Campaign Trail". CBC News. http://www.cbc.ca/archives/categories/politics/provincial-territorial-politics/on-the-nunavut-campaign-trail/topic-on-the-nunavut-campaign-trail.html. Retrieved April 26, 2007. ^ "GN appoints IQ advisory council". September 12, 2003. http://www.nunatsiaqonline.ca/archives/30912/news/nunavut/briefs.html. Retrieved April 9, 2017. ^ "Prince Edward and wife Sophie arrive in Iqaluit". CBC News. September 13, 2012. http://www.cbc.ca/news/canada/north/prince-edward-and-wife-sophie-arrive-in-iqaluit-1.1140375. ^ "Nunavut licence plates 1999–present". 15q.net. http://www.15q.net/nu.html. Retrieved February 16, 2011. ^ "Facts about Nunavut: About the Flag and Coat of Arms". Archived from the original on March 7, 2013. https://web.archive.org/web/20130307115642/http://www.gov.nu.ca/en/Flag.aspx. ^ "Newspapers in Nunavut". Altstuff.com. http://www.altstuff.com/newsnu.htm. Retrieved November 10, 2011. ^ "Qiniq". Qiniq. http://www.qiniq.com/. Retrieved November 10, 2011. ^ "Netkaster". Netkaster.ca. http://www.netkaster.ca/. Retrieved November 10, 2011. ^ George, Jane (November 3, 2006). "Nunavut’s getting animated". Nunatsiaq News. http://www.nunatsiaqonline.ca/archives/61103/news/nunavut/61103_06.html. Retrieved November 8, 2011. ^ "Nunavut Animation Lab: Lumaajuuq". Collection. National Film Board of Canada. http://www.onf-nfb.gc.ca/eng/collection/film/?id=57615. Retrieved November 8, 2011. ^ "Inuit films move online and into northern communities". CBC News. November 2, 2011. http://www.cbc.ca/news/arts/story/2011/11/02/nfb-inuit-film-project.html. Retrieved November 5, 2011. ^ "New NFB collection includes 24 films on or by Inuit". Nunatsiaq News. November 4, 2011. http://www.nunatsiaqonline.ca/stories/article/65674new_nfb_collection_includes_24_films_on_or_by_inuit/. Retrieved November 7, 2011. ^ "Bringing circus – and new hope – to a remote Arctic village". Christian Science Monitor. http://www.csmonitor.com/World/2009/1222/Bringing-circus-and-new-hope-to-a-remote-Arctic-village. Retrieved December 28, 2009. ^ a b c "Iqaluit hopes to curb alcoholism and binge-drinking by opening city's first beer store in 38 years". http://news.nationalpost.com/news/canada/iqaluit-hopes-to-curb-alcoholism-and-binge-drinking-by-opening-citys-first-beer-store-in-fifteen-years. Retrieved 2015-11-23. ^ Communications, Government of Canada, Department of Justice, Electronic. "Department of Justice - Legal Aid, Courtworker, and Public Legal Education and Information Needs in the Northwest Territories". http://www.justice.gc.ca/eng/rp-pr/aj-ja/rr03_la8-rr03_aj8/p10.html. Retrieved 2015-11-23. Script error: Martin, Ian. Aajiiqatigiingniq Language of Instruction Research Paper. Nunavut: Dept. of Education, 2000. This page uses content from the English language Wikipedia. The original content was at Nunavut. The list of authors can be seen in the page history. As with this Familypedia wiki, the content of Wikipedia is available under the Creative Commons License.